Had a chance to try the recipe for Mango Chutney Curry Chicken Salad from DrDave today As previously seen here! 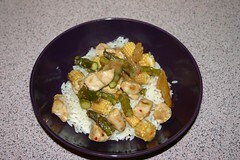 We altered the original recipe a bit and came up with a very nice Mango Chutney Chicken Curry with baby sweetcorn and asparagus. Firstly fry some chicken bytes in a wok with a little olive oil. 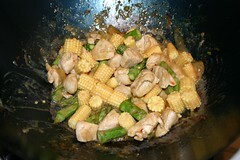 Add some red curry paste and stir vigorously until the chicken bytes, and wok, are well coated. Then add a couple of spoons of the spicy mango chutney. Finally add a dollop of Greek yoghurt to slacken he sauce and simmer. What does the beta in “beta software” really mean?